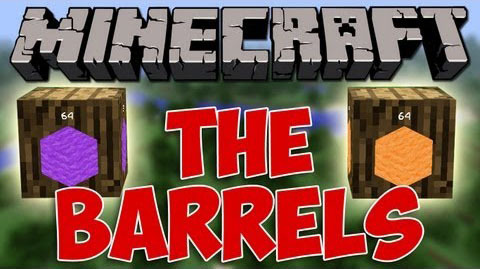 Barrels Mod is a mod that is created to not only add three similar blocks but also to help players to store mass quantities of a certain item. This mod adds many features that make them easier to work with. Putting in items is as simple as right clicking a barrel with an item in your hand. Getting annoying putting a stack of items in at a time? This mod fixes that by taking every item in your inventory into the barrel by double-right clicking the barrel! Want to take items out? Left click the barrel! Make sure you’re not in creative though. Just want to take one item out? Sneak while clicking the barrel! Try it out! Is your Barrel getting a bit too clogged up and want an upgrade? With a higher tier barrel, double-right click the barrel to upgrade in it. Make sure you only have one barrel in your inventory because Barrels Mod basically swaps the barrel. Want to use other mod like Build Craft or Red Power? Barrels Mod is compatible with those mods and will function normally with those mods. Put items in from the top and out from the bottom. So you can include barrels into your automatic sorting system! 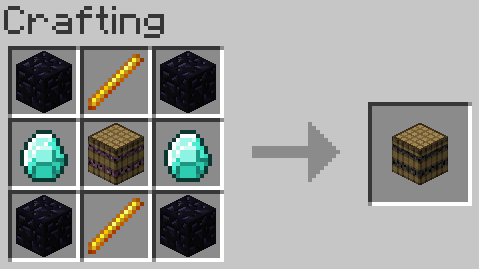 This mod adds three blocks all storing different amounts of items. 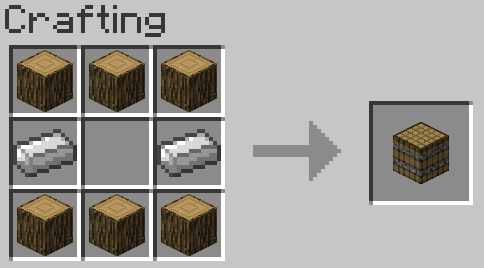 Crafting recipes and the amount of items the barrels can hold is configurable. You can put items into a barrel by right-clicking with your hand. All the items (if the barrels is not full) will be put into the barrels only if the item in your hand is matching the item, in the barrel. You can take items out by left-clicking the barrel as if you were braking it. It will take out a stack at a time. If you want to take out individual items, you can sneak (default key is shift) and click the barrel. If you want to put all the items in your inventory into the barrel, you can double right-click on the barrel. If you want to upgrade a barrel (a barrel is nearing or is at capacity), you can double right-click a barrel with a barrel that is of a higher capacity. This will swap the barrel that is in your inventory with the one that is in your world without having to replace it having to re-sort all your items. Make sure you only have one barrel in your inventory or it won’t work. 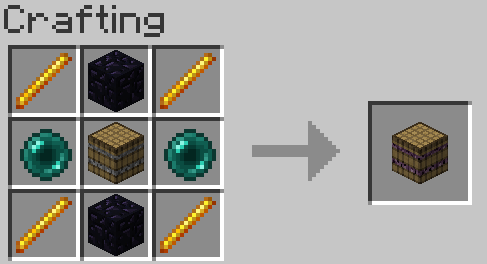 Barrels work with hoppers and dropper and other mods that have inventory changing blocks just like they would with chests, but only accept one item. Note that by default items can only exit/enter by the top and bottom. This can be changed in the configuration option. If you don’t like the plain look of a barrel, you can put a item frame on a barrel and it will take full advantage of it. By sneaking (default key is shift) and right clicking a item from an a side of a barrel, the item frame is going to snap onto the barrel and display whatever is in the barrel. If you want to take a item frame off the barrel, just place another item frame and both will pop of the barrel.